Authors will often tell a story from the point of view of a young character, one whose innocence precludes the need to delve too deeply into a sensitive subject. There are countless novels of the Holocaust told through a child's eyes, with the child blissfully unaware of the bigger picture. 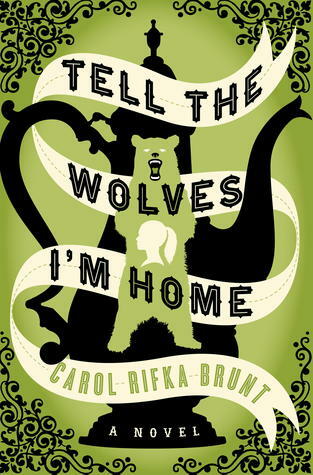 In TELL THE WOLVES I'M HOME, Carol Rifka Brunt opts to follow the formula. The novel is told by June, who also follows the other stereotype as the 'weird' sister of the family. That makes the girl an outsider and it is always the outsider who sees things more clearly because they're on the outside looking in on the more popular kids. The novel is almost historical fiction, with a setting in the late 1980s when the AIDS epidemic was so new that no one really knew the cause or how the disease was transmitted. June's uncle dies of AIDS early in the story, and June must come to grips with losing her beloved uncle while fielding the harshness of her older, talented, prettier sister. Isn't it always that way? What more do you need to establish some conflict than pit teenaged sisters against each other? So there's June in mourning and there's her mother (distant, of course and too busy to pay the daughter much attention) who blames the dead man's lover for essentially murdering her brother. It comes as no surprise that June, the outsider, is drawn to the lover who is naturally another outsider because he's a gay man. It's a bit of forbidden fruit, with June sneaking around to meet the man whom her mother despises, all to learn more about her uncle's unknown private life. While she does this sneaking, June's sister falls apart under Mammy's pressure to excel, and as the story progresses we see the conflict grow between sisters who cannot communicate because they are too young to know how. They can only express themselves to each other by painting on top of a portrait their famous uncle painted of them right before he died. The narrative has a tendency to drag through long bouts of navel gazing and ruminations on the rather insignificant, but when your narrator is a child, there is no room to spread out within an insular world. I found myself skimming through long passages, in search of the story that got bogged down in the mundane. In the end, June saves the day, and her family arrives at a place of greater understanding. The novel could be labelled a coming of age tale, with little June growing up as she discovers the truth about her mother's tense relationship with the uncle, a relationship that mirrors June's tense relationship with her sister. It's all a lot of jealousy and misunderstanding that is solved with the deaths of those who came between brother and sister and then sister and sister. Though rather long for a YA novel, this one feels like a good fit for angst-ridden teen girls who seem to find drama in nearly everything and often feel as if they don't fit in with the rest of their age group. They will easily relate to June.